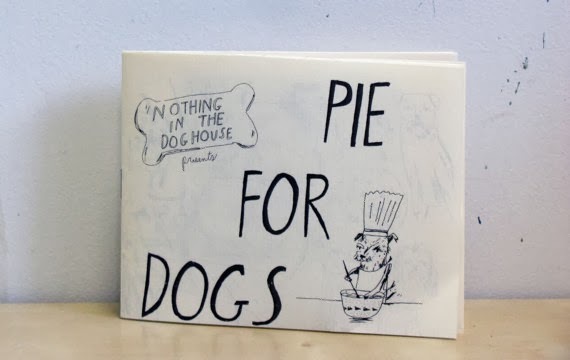 Nothing in the House: Nothing In The Dog House Presents Pie for Dogs! Nothing In The Dog House Presents Pie for Dogs! Don't know what to get your dog for Christmas? Pick up a copy of Pie For Dogs, written by me, illustrated by Elizabeth Graeber, and tested by Chickpea (featured on the cover)! 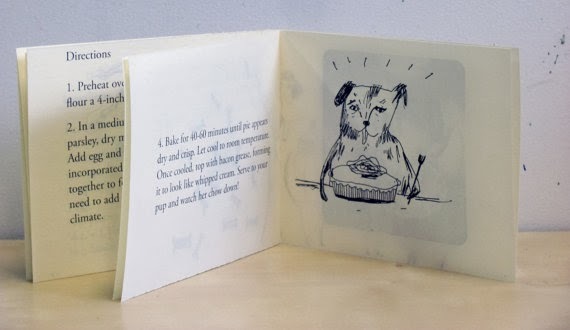 Inspired by the dog pie with bacon grease whipped cream that I made for Chickpea's birthday, Elizabeth and I made this little zine so wo/man's best friend can enjoy our nation's favorite dessert. It includes a recipe for a canine-friendly pie adapted from a King Arthur Flour dog treat recipe. You can find it for sale on Etsy and soon at Meeps & Treasury in D.C.
Labels: dog pie, dog treat pie, nothing in the dog house, pie art, pie books, pie for dogs, Washington D.C.